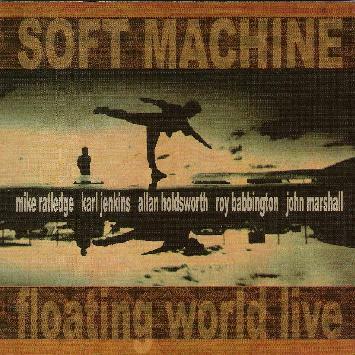 Soft Machine - "Floating World Live"
Floating World Live is a superior live performance by the same Softs line-up that would eventually record the Bundles album in 1975. It's a sparkling live recording (by Radio Bremen in January 1975) that emphasizes the astounding talents of then unknown guitarist Allan Holdsworth but features the group as a whole in fine late-Soft machine form, not unlike what King Crimson and the Mahavishnu Orchestra were doing at approximately the same time: lightning fast lead guitar from Holdsworth, Mike Ratledge's driving organ and quirky EMS synthesizer improvisations, and a chugging rhythm section. There's little in the way of technique or thematic orientation that connects this version of the Softs with the line-up that recorded the group's first three classic albums, culminating of course with the masterful Third. Instead, Floating World Live features a more polished ensemble which, though perhaps less innovative than other incarnations of the group, at least matches the fiery instrumental excesses of other fusion bands from the same era. Both "The Floating World" and "The Man Who Waved at Trains" feature plenty of Ratledge's ethereal keyboard ambiences, the former in particular living up to the lofty aspirations of its title with some mesmerizing organ and Karl Jenkins' breathy oboe gliding above the restrained, tasteful percussion of John Marshall. The improvisational "North Point" is essentially a showcase for Ratledge as he goes wild twisting and turning the knobs on his EMS, producing some absolutely other-worldly tones reminiscent of Morton Subotnick and early Jan Hammer. Then there's the monster jam of "Hazard profile" that churns up the ground like a massive tornado. Holdsworth's manic guitar simply overpowers everyone else in a breathless display of melodic invention. "Song of Aeolus" slows the pace down just a bit, with some extraordinary piano from Jenkins and a truly inspired organ solo from Ratledge. There's more of course and too much to summarize in a brief review, but there's little question that of all the Soft Machine material released since the group's demise, Floating World Live is the definitive concert document. In particular, for fans of Holdsworth, Floating World Live shows the elevation of a guitarist into the front rank of axe-grinders during the fusion era. An essential disc for any devotee of this seminal group. For more information you can visit the Moonjune Records web site at: http://www.moonjunerecords.com.